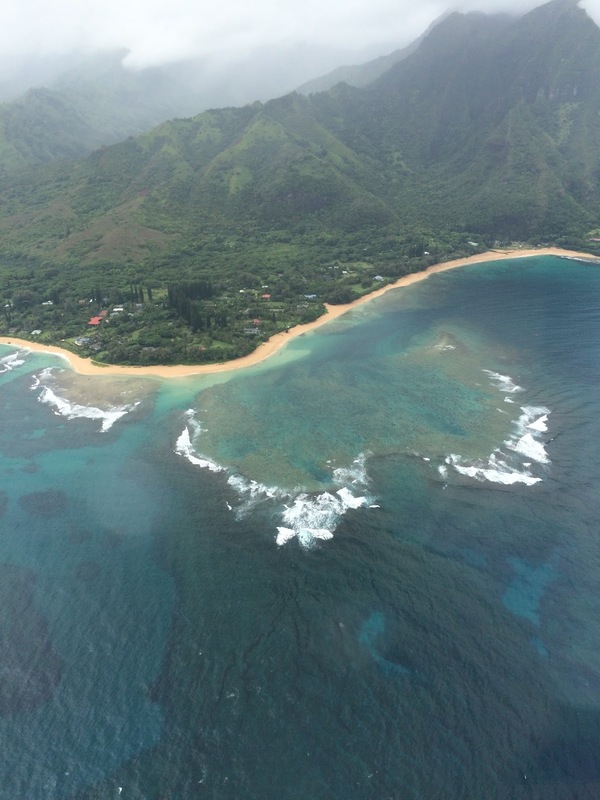 During our airplane tour on our first full day of vacation, Captain Josh had mentioned that Tunnels Beach on the north side (near Ke'e Beach) was a famously great spot for snorkeling, and we had seen the large reef from the plane. There was snorkel equipment in our condo, and our snorkeling experience during the Na Pali boat tour had whetted our appetite, so we decided to go to Tunnels with masks and flippers. On our way out of Kapa'a, we went across the street from our building to Passion Bakery Cafe for their famous macadamia nut sticky bun and a "croisscone," which is supposed to be a croissant-scone hybrid. Both were very good, though the sticky bun was softer than I expected, and I failed to discern the croissant nature of the croisscone. 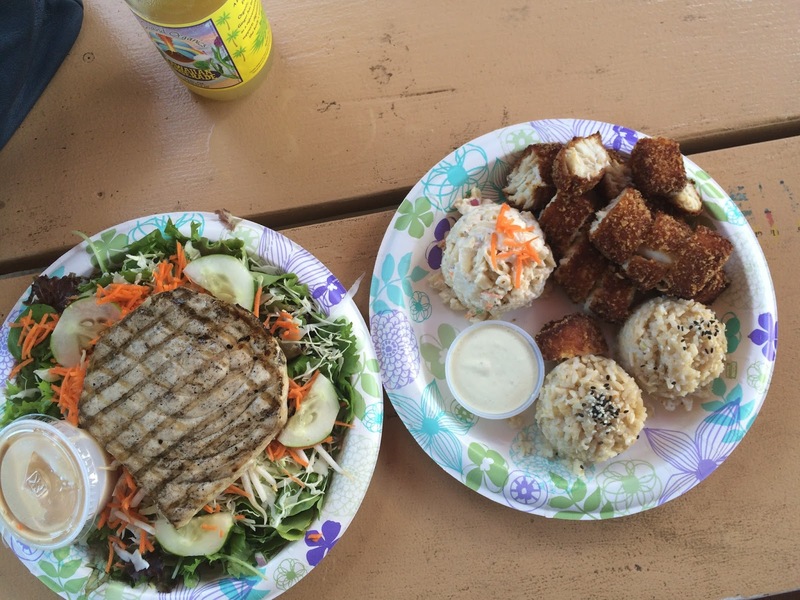 We again drove north, through Hanalei, until we reached Haena Beach Park and Tunnels Beach. 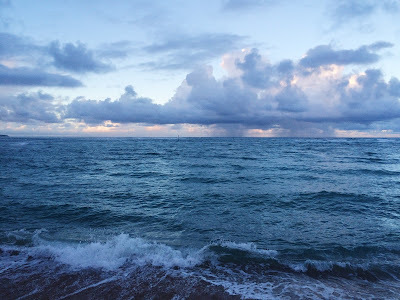 The reef at Tunnels Beach extends nearly to the edge of the water, and in some spots the water is too shallow to float above the reef, so it took some time for us to figure out a sandy route out into sufficient depth for swimming. But even before we did so, we could see colorful fish swimming around us, and it only got better once we started swimming in slightly deeper water. The reef itself was rather bland in color, but after about an hour we had lost count of all the different fish varieties; it was at least 15, in all sorts of vivid color combinations. There were lots of snorkelers, but the fish didn't seem to mind, though presumably they did mind the spearfishers we saw at one point. Anyhow, a great morning! We didn't have an underwater camera, but here's a chart of Hawaiian fish for some perspective. 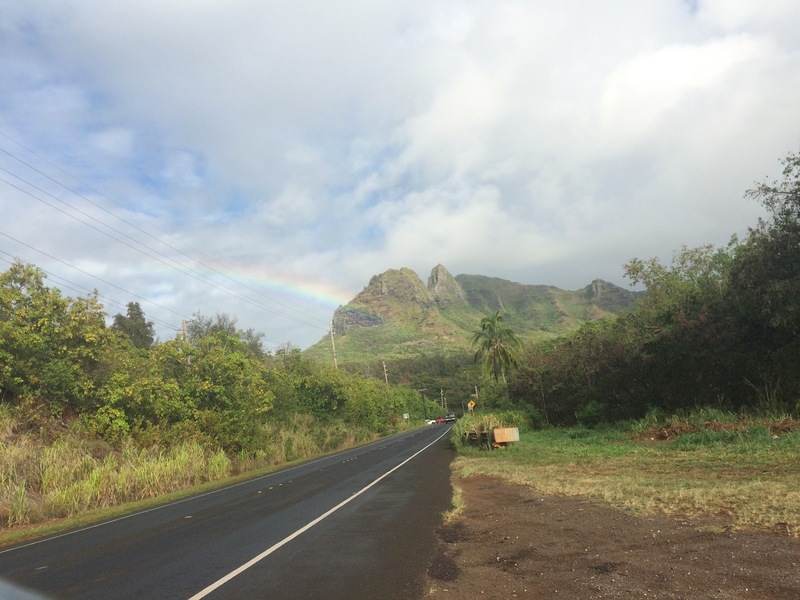 Our return drive through Hanalei provided a reminder that bad drivers are everywhere, not just in Los Angeles. Hanalei has many one-lane bridges, on which the etiquette is that about 5-7 cars at a time will cross from one side, while cars going the other direction will pause and wait. In general it works well, and seems refreshingly pleasant and civilized. However, there are two bridges near Tunnels that are nearly attached at approximately a 135-degree angle, so cars on both sides have to look very carefully at both bridges before deciding whether to cross. Several cars (not us!) failed to do so, and we found ourselves in a series of face-offs requiring a balance of caution (backing up into a small off-road area between the bridges) and assertiveness (forcing a recklessly advancing car to back up off the bridge). Not so fun, but we and our rental car got through unscathed. After that, some more coffee and lunch was warranted, so we stopped in Hanalei town for coffee and a papaya-coconut-pineapple-ginger smoothie at Hanalei Coffee Roasters, followed by hot dogs with coconut and pineapple relish and lilikoi mustard at Puka Dog (pretty good but forgettable). We de-sanded at home, rested, and then went to Kilauea Fish Market for a simple but satisfying dinner of salad with grilled Nairagi fish and rice with mochi Ono. 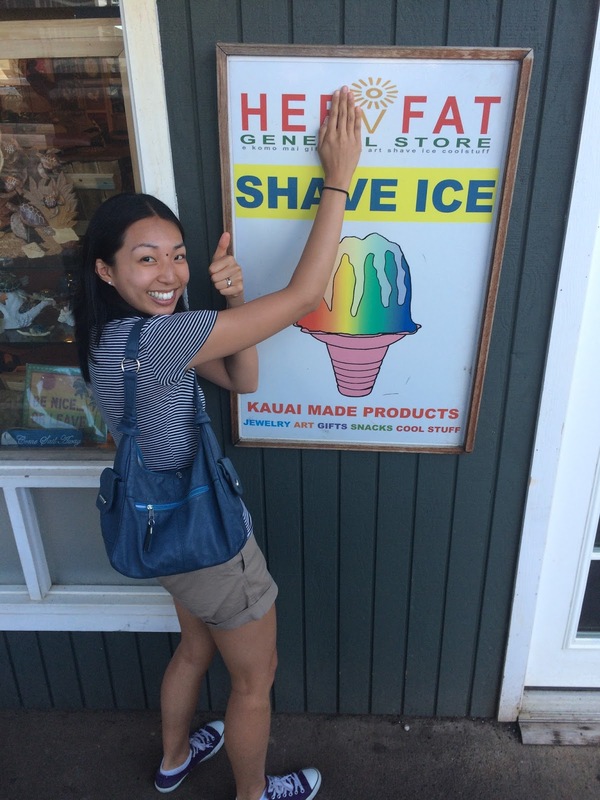 The evening ended with one last shave ice at Hee Fat and one last walk along the beach path. The next morning we cleaned up the condo, picked up croisscones at Passion Bakery, and then drove to Lihue airport for our flight back to California. It was a wonderful and much-needed vacation, and we're already looking forward to our next trip to Hawaii. To my husband: between our wedding and honeymoon, I couldn't have imagined a better beginning to our married life, and I'm grateful every day for your love and our partnership. May we have many more adventures together!